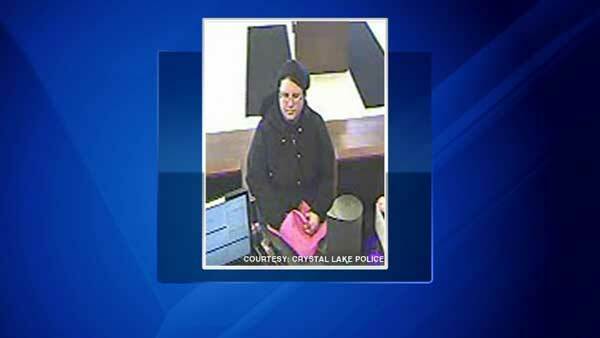 CRYSTAL LAKE, Ill. -- A search is underway for a woman who robbed a bank in northwest suburban Crystal Lake. Police said surveillance photos show the suspect at the Chase Bank in the 1100-block of South Route 31 around 11 a.m. Saturday. Surveillance photo of a woman who robbed a Chase Bank in Crystal Lake. Workers said the woman gave them a note demanding cash, but did not show a weapon. She then got away with an undetermined amount of money in a dark-colored SUV, which witnesses said may have been a Nissan Rogue, heading north on Route 31. Police said the suspect was described as a Caucasian woman in her mid-30s with dark hair, between 5 ft. 4 in. and 5 ft. 7 in. tall, weighing between 160 and 200 lbs. She was wearing a black three-quarter length windbreaker with a hood, a dark-colored hat, eyeglasses, black pants, and black gym shoes with white soles. She was also carrying a pink purse. A $1,000 reward is being offered in the case. Anyone with information regarding this bank robbery should contact Crystal Lake police at (815) 356-3620.